It is not often that we will find a team take five more shots and end up being so comprehensively defeated. This is when context is required to ensure the game flow is taken into account. From the 68th minute onwards, when all intensity had left the game, Cavan scored 1 – 05 from 8 shots with a combined Expt Pts of +4.72. 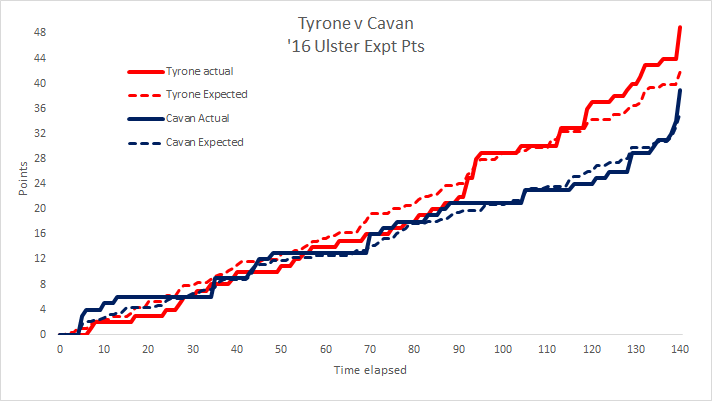 In the original game the late goal helped Cavan outperform their Expt Pts whilst Tyrone’s shooting saw them return ~3 points below expected. 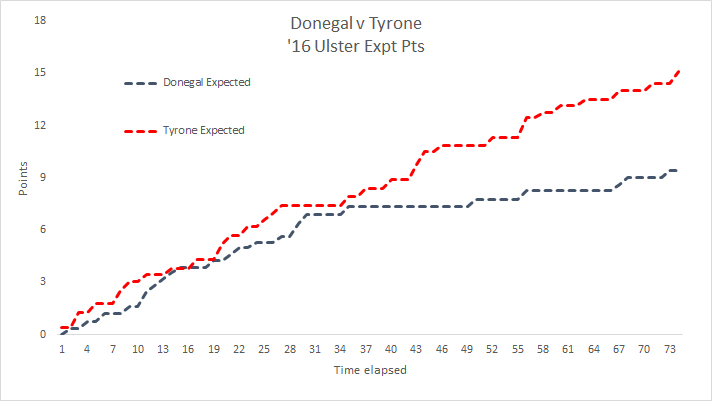 Show the two games back to back and we begin to get a sense of just how much Tyrone dominated – not just in terms of total scores but also in Expt Pts. Harte had a great game scoring 2-04 from just the six shots producing an Expt Pts total of +4.40. Within those scores there was a free on his left, two points from play, with one off either foot, and three goal attempts returning 2-01. He was also on the shoulder form McAlliskey’s 3rd goal so, being unrealistically greedy, as good as his day was it could have been even better. Still that accuracy was good enough to place his returns 4th overall since 2012 (>100 TV games in that span). Tyrone had six goal shots in the replay scoring 5-01. Generally speaking that is unrepeatable however more surprising than this level of accuracy was the fact that the goal attempts did not occur in the first game when they only produced the solitary McNulty attempt. 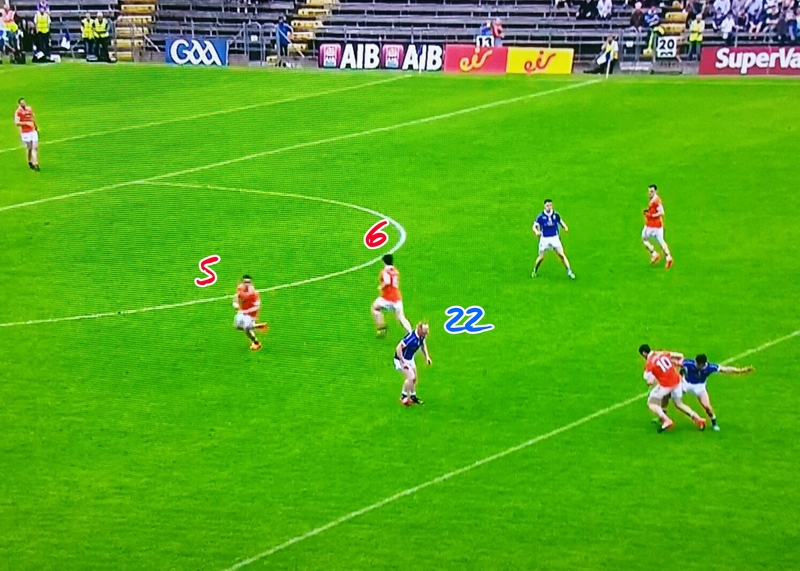 Tyrone ran down the throat of Cavan but this “soft” center was identified in the Armagh game where on more than one occasion there were Armagh men standing on their own centrally in front of goal. Their 2016 deadball performance has indeed been very poor but do we base our view on the most recent returns or smooth it out over time? Is the 2016 form natural variance due to small sample size or the manifestation of something more serious? Only time will categorically answer that one however it is fair to say that at best their deadball striking reaches average whilst on current form it is very poor. Tyrone have used six different players to take deadballs in that six game span. Evidence would suggest that this chopping and changing is as a result of not having any great free taker – as opposed to the poor returns being as a result of the chopping and changing – however I am not sure why Séan Cavanagh was taken off the frees. Granted we do not have the games from their qualifier run last year however he was three form three against Donegal up in Ballybofey and hasn’t taken one in the five games since. It is worth remembering that he was 67% (16 of 24) with an Expt Pts tally of -0.04 during 2013 & 2014. Average yes but looking at Tyrone’s returns of late they would take average. Possessions, attacks, shots & Expt Pts were all very similar yet Cavan had this game wrapped up in the 57th minute when Campbell’s penalty was saved and Séanie Johnston scored on the subsequent possession. How so? The first port of call is Armagh’s relative under performance on the scoreboard. They left the guts of 1-01 behind them when Campbell missed a 13m free in the first half and that penalty in the second. The chances of scoring 0 – 00 from those two shots is ~0.3%. 0.3%!! Of course this means that excluding these two misses (I know you can’t but bear with me!) Armagh’s shooting was satisfactory. 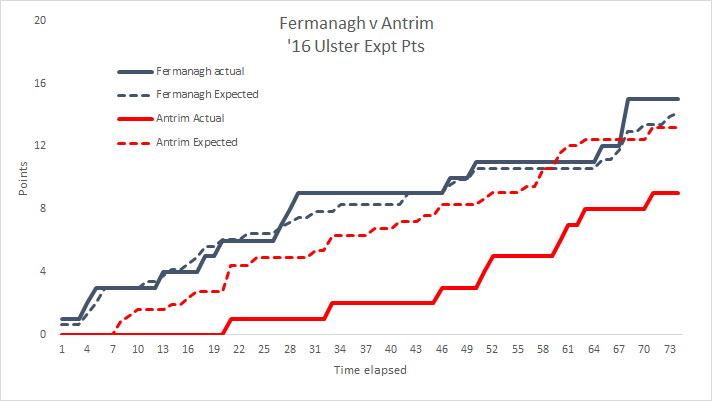 From the remaining 26 shots Armagh had an Expt Pts return of 13.47; they scored 0-14. Their deadball striking was very good (once we have removed the missed 13m free!) with 9 shots producing a score of 0 – 08 off an Expt Pts tally of 6.59. From play their returns were 0 – 06 scored from 16 shots (Expt Pts of 6.88). You couldn’t have a cleaner, more impressive chart if you were Cavan. Armagh just could not get inside at all. That changed to some degree in the second half but the damage was done – they were chasing the game with absolutely no goal threat (indeed outside the penalty Armagh didn’t have a goal attempt all game). Cavan had two goal chances and converted both. Their point taking was also very efficient. From play they were 0 – 11 from 21 shots (Expt Pts of 9.66) whilst also returning 0 – 05 from deadballs (7 shots; Expt Pts 4.97). A repeatable performance? There was nothing to suggest otherwise. There was no real shot concentration in any one area, no over reliance on frees whilst the conversion rate for shots taken under pressure at 60% (6 from 10) was better than those taken without any pressure applied – 45% (5 from 11). It was a good performance but what caught the eye more, looking ahead to Tyrone, was what Cavan did, or more accurately did not do, from a defensive perspective. Yes they protected the D but there was a vulnerability down the centre. 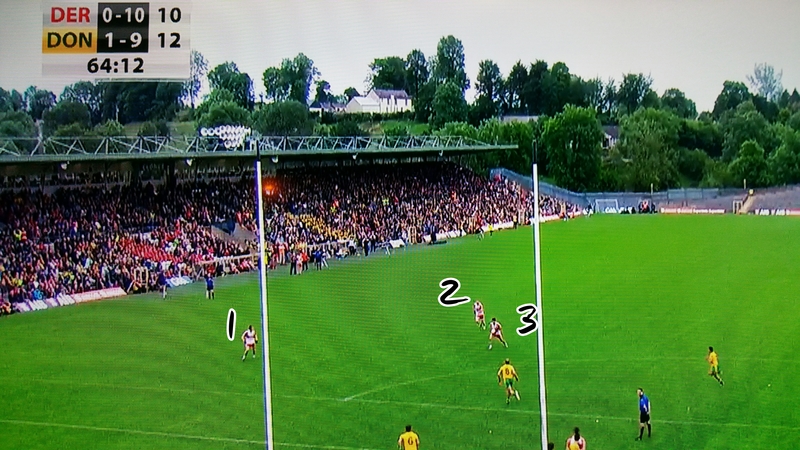 Above are two instances where Armagh have an overlap straight through the heart of the Cavan defence. 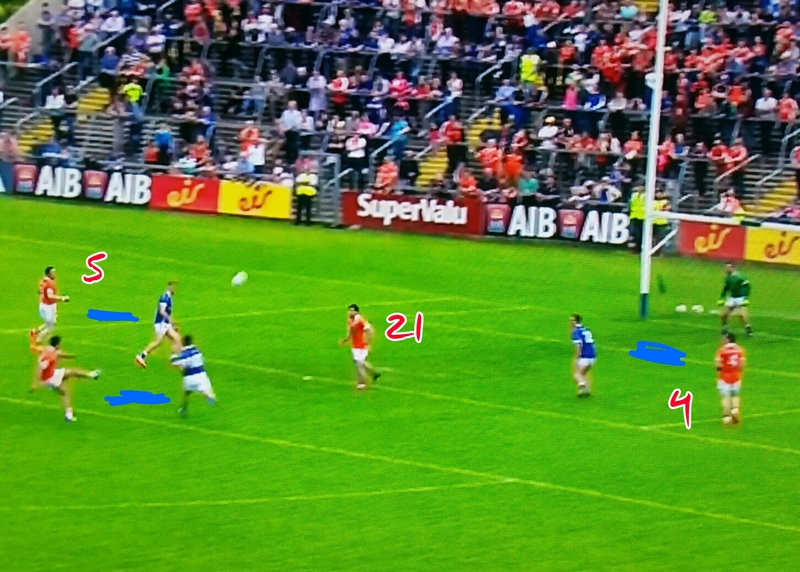 In the first Mackey (22) is drawn towards Grugan (10) leaving both Mallon (5) and Forker (6) completely isolated at the top of the D. In the second Campbell shoots but if he slips the ball inside McKenna (21) is standing all on his own at the top of the large rectangle. Snapshots to be sure – and any team can look exposed with an instantaneous snapshot – but these were not the only examples. Twice Armagh won easy frees in the first half when running straight through the middle. Given Tyrone’s style I can see Donnelly, Harte et al looking to drive through the 45 the next day. One topic that generated a lot of discussion was Armagh’s kickout strategy. A lot was made of the late switch in the Armagh goalkeeper and the impact this had on the outcome. Firstly Armagh “won” 83% of their own kickouts. This however included 20 that went short (or appeared to go short*); strip these out and Cavan edged the Armagh kickouts 5-4. This is by no mean disastrous nor even out of kilter with the norm. Armagh scored 0 – 07 from the possessions they obtained from their own kickout and coughed up 0 – 03. That 0 – 03 is generally fine but appeared to be much more as the game was progressing as a result of (a) two quick back to back Cavan points in the first half giving the impression of a large scale issue and (b) the commentators continually referencing Armagh’s kickout problems**. It wasn’t their own kickout that was the problem. It was Cavan’s. Cavan had 17 kickouts and only one of these went short – an unusual stat in and of itself. Of the remaining 16 Armagh only “won” two. Considering all 16 were contestable – landing outside the 45 – this is a very poor return. Whereas Armagh had a net result of 0 – 04 on their own kickouts (0-07 scored versus 0 – 03 conceded directly from the kickout) Cavan had a very comfortable net return of 1-05 in their favour on their own kickouts. Armagh had a fairly average day on their own kickouts – nothing destructive. Cavan however had a day of days on theirs. A quick note on Campbell. He had 14 shots in total with an Expected Return of 10.13 and the return of 0 – 08 shows an absolute mixed bag. His day will be remember for the penalty & missed 13m free however outside of those he was excellent converting 67% (8 from 12) and scoring +1.33 above Expected. 14 shots is the joint highest recorded by any one player in a Championship game***. The others to reach 14 were Séan Quigley against Laois in 2014, Martin Dunne for Cavan against Armagh in 2013 and Conor McManus in Monaghan’s defeat to Dublin in 2014. *You can always tell when RTE are not in control of the production. You will rarely miss anything in a game when they are in charge – here there were numerous kickouts not shown. I counted nine in total. Normally this isn’t really an issue as the camera will catch where the ball lands, or we’ll return to the game with a back advancing after obviously taking a short kickout. Here though we missed complete possessions! Where there were gaps in the game a level of judgement had to be overlaid on the data. ** as an aside one of the best pieces of advice I was given was to watch the game with the sound off. This emanated from amateur boxing where you begin to focus on the footwork rather than the punches the commentator calls. Similarly in horse racing your eyes get drawn to places other than the front of the race. If you are interested in analysis record the next GAA game and watch without the commentary on. As the game progresses pick 3 or 4 things you notice that teams/players are doing and which you feel are important. Watch the game back and listen to the commentary. Are your items picked up? Are they emphasised? Does the newspaper and forum chatter revolve around what you saw or what the commentary told the audience to see? This is not a go at commentators – theirs is a very hard job (to do well). But what they observe live can set an agenda that has nothing to do with what won/lost the game. Despite Derry being down to at least 14 men for the last 20 minutes both teams produced similar total possession, attack and shot volumes. Unfortunately for Derry that was where the similarities ended. 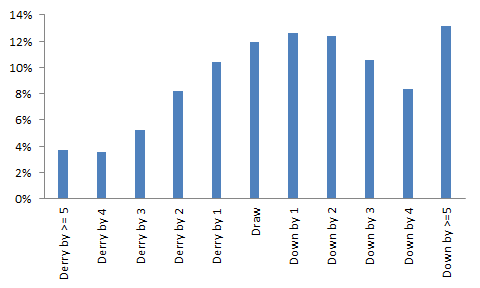 Over the 70 minutes Derry amassed 289 individual player possessions (instances where a Derry player controlled the ball). That equates to 6.3 players on the ball per team possession with 93, or 32%, of those touches occurring inside Tyrone’s 45. Tyrone’s 47 team possessions included, in relative terms, a mere 201 player possessions (4.3 player possessions per team possession) with 56, or 28%, occurring inside Derry’s 45. Tyrone were much more decisive and incisive, moving the ball at speed whilst Derry were ponderous eking out the metres in a series of hand passing necklaces around the main scoring zone. Yes they had 37 (93 to Tyrone’s 56) more player possessions inside the opposition’s 45 but the quality of those possessions is borne out in the Expected Points (Expt Pts) gap. Derry manufactured three less shots than Tyrone but more tellingly the shots they did produce were expected to score in the region of 8.5 points less than Tyrone’s. For all Derry’s possession there was no bite, no incisiveness and a lack of an end product. One of the major factors in the margin of victory (and thus the Expected Points gap) was the type of shot attempted. As a unit both teams scored close to what was expected yet Tyrone dished out an eleven point beating with only three more shots. How so? 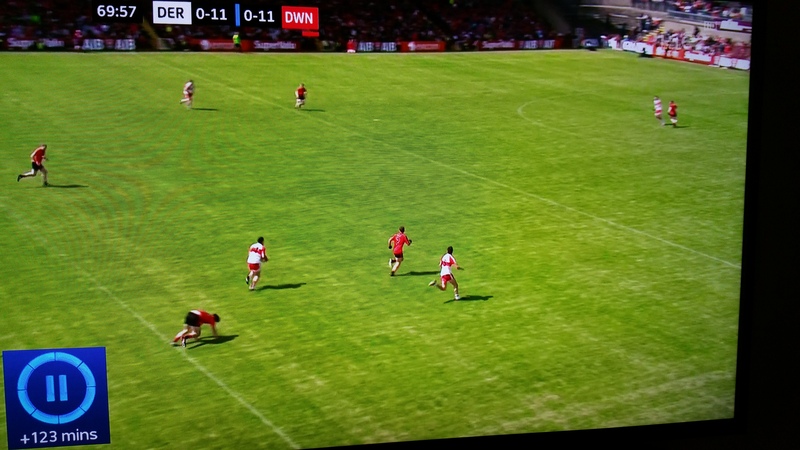 As stated previously Derry’s attacking play was ponderous allowing Tyrone to filter back and protect the D. Derry had 18 attempts for a point from play throughout the game; only two of those came from inside the prime scoring zone (extending from the D in towards the goal) with none at all in the 2nd half. Outside of this only one other point attempt came from inside the 20m line. Derry’s fundamental lack of attacking speed allowed Tyrone to set defensively which in turn aided them in repelling Derry away from the most productive shooting zones. 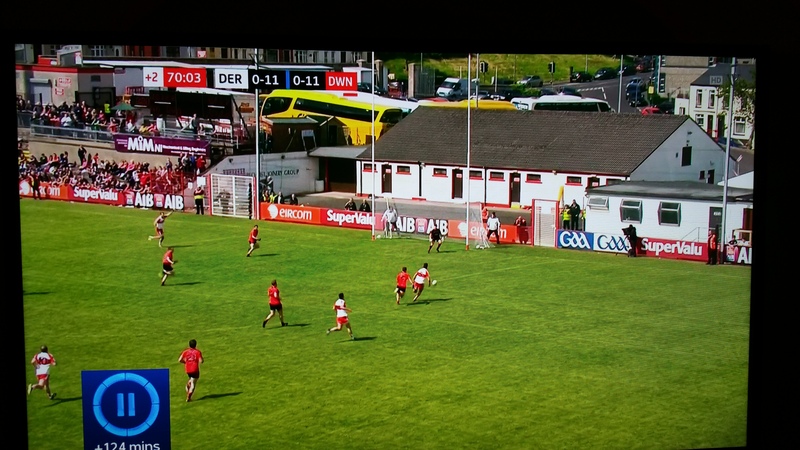 Derry were then forced to try less productive long range efforts. 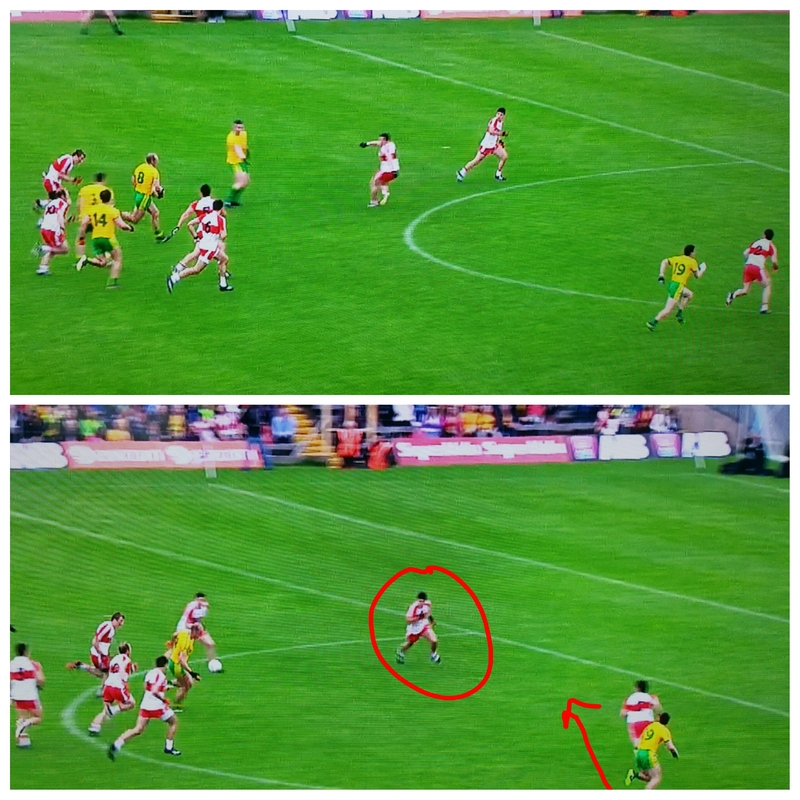 Indeed in a testament to Tyrone’s defensive solidity one of the two point attempts that came from inside the scoring zone was blocked (McFaul’s effort just outside the 20m line in the 23rd minute). Derry’s shooting from these long range efforts was almost exactly what was expected; 0–05 scored from 15 attempts with an Exp Pts return of 5.11 for those 15 shots, but even with elevated shooting those chances are never going to keep pace with a team scoring at the rate Tyrone were. Tyrone had 19 attempts at a point from play with five of these coming from inside the scoring zone. Another seven were attempted inside the 20m line. Not every shot inside the 20m line is the best option – Kevin Johnston’s attempt in the first minute being a prime example – but they are an indicator of a team getting in behind a defense. After being drawn up the field in an attempt to work their way through the Tyrone defensive shield Derry were unable to counter Tyrone’s attacking speed. 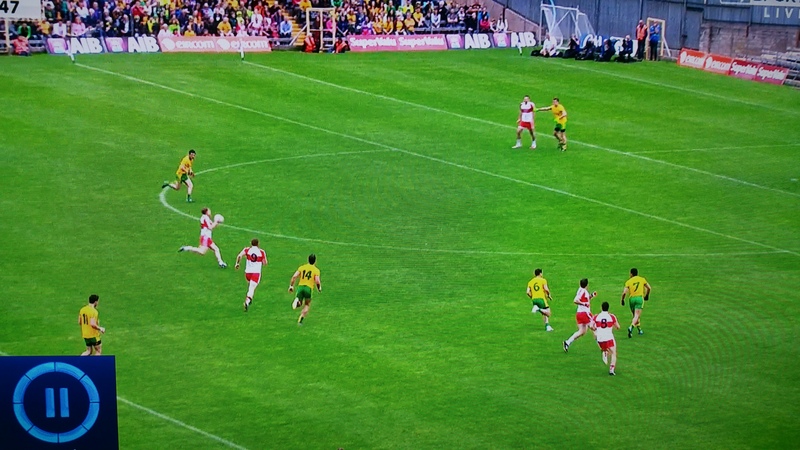 This was best illustrated for Ronan O’Neill’s first goal when Brendan Rodgers was dispossessed inside Tyrone’s 45. Richard Donnelly chipped the loose ball off the ground to Mark Bradley and set out in support. Seven seconds and two hand passes later Donnelly launched a pinpoint pass, from outside the 45, to O’Neill on the edge of the square. Simple, direct, accurate and with no little degree of skill involved. In addition to the more advantageous point attempts Tyrone had six shots at goal converting three whilst Derry, again despite all the possession they had inside Tyrone’s 45, only manufactured two with both coming in the goal mouth scramble at the start of the 2nd half. In total 60% of Tyrone’s shots came from attempts from play either inside the main scoring zone or in close to goal. Only 19% of Derry’s came from similar positions. Ultimately Tyrone moved with speed and purpose and despite having so much less of the ball (in terms of player possessions), and less of that ball inside Derry’s 45, their accuracy produced easier point taking opportunities and more goal chances. Fermanagh will have areas to work on in the run up to their Ulster QF with Donegal but here, against Antrim over 70 minutes, they were by far the stronger in all the key metrics – more possessions, more attacks and more shots. Another area will be their conversion of possessions to attacks which, at 71%, was quite poor. Against Dublin last year for instance they produced, considering the opposition, a much more impressive 73%. The low attack rate may be easier to rectify than the shooting however as it was directly linked to their extremely poor opening 30 minutes in the second half. During that period Fermanagh managed only seven attacks (from 15 possessions – an attack rate of just 47%) and four shots opening up the possibility of an unlikely Antrim comeback. In the first half their attack rate was 81% from 26 possessions. Pete McGrath and his backroom team will hope the first half, when the team was at the pitch of the game, is a truer reflection of Fermanagh’s attack. What of Antrim? They had an awful opening 20 minutes, as the above chart highlights, from which they were never able to recover. Three of their first four possessions saw quick, indiscriminate long balls into the forward line that did not stick. This was then followed by six scatter gun shots that failed to find the target. Only Tomás McCann’s missed free kick in the 8th minute came from anything resembling a central position. Coming out of that opening period they were already six points down and the game was effectively over as a contest. To their credit Antrim did perform much better in the second half, scoring 0 – 07 from 12 shots (two more shots than Fermanagh and a respectable 58% Conversion Rate) but whether this was a truer reflection of Antrim, or a direct correlation to the aforementioned anaemic display of Fermanagh, only the rest of the year’s Championship will confirm. Again looking forward to the Donegal game one area of note will be the kickouts. At a very high level Fermanagh will be satisfied with their overall returns. They won 78% (14 of 18) of their own kickouts and 39% (9 of 23) of Antrim’s. Indeed their overall possession advantage of seven is nearly all contained within their kickout success. But therein lies a concern. To attain such a healthy win percentage Fermanagh went short on eight of their kickouts but did not manage to score anything from those possessions. Indeed they only manufactured four shots. When the kickout went past the 45 the result was a less convincing 6 – 4 to Fermanagh. Antrim only went short twice; of all their kickouts that travelled past the 45 the result was 13 – 8 in Antrim’s favour. Donegal will not go as long as Antrim did. Over the last two Championships Donegal have gone short on 29% of their kickouts. This will immediately wipe out the possession advantage Fermanagh enjoyed in this game and place more pressure on securing their own kickout. They did a very good job of that here however they will have to do more, in terms of shots and scores from these possessions, than was the case here. Finally we cannot pass without mentioning Tomás Corrigan’s display. He accounted for 58% of Fermanagh’s shots but his day will probably be best remembered for the two acute sideline points mid-way through the first half. Looking at historical results the chances of converting two back to back sidelines is just under 8% but getting and converting two within 90 seconds? That is slim enough to already warrant entry into “moment of the Championship”. And yet his contribution does not end there; he was 3 from 3 from play converting two with his left and one with the right. Outside the three sideline attempts – as well as the two converted in the first half he attempted one with the last kick of the game – he was 67% on frees scoring 0 – 04 from six attempts which is more or less in line with the Expt Pts (3.88 for the six frees combines). All round an excellent, accurate and classy display.